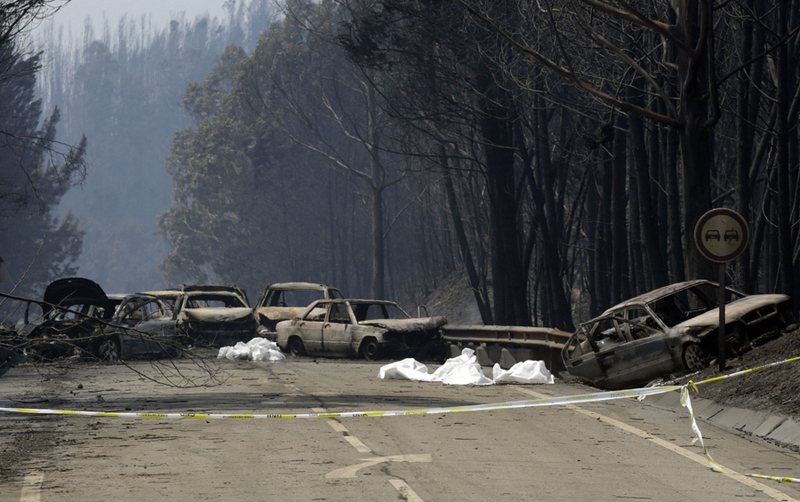 PEDROGAO GRANDE, Portugal — A raging forest fire in central Portugal killed at least 62 people as they desperately tried to flee, charring cars and trucks as it swept over roads. 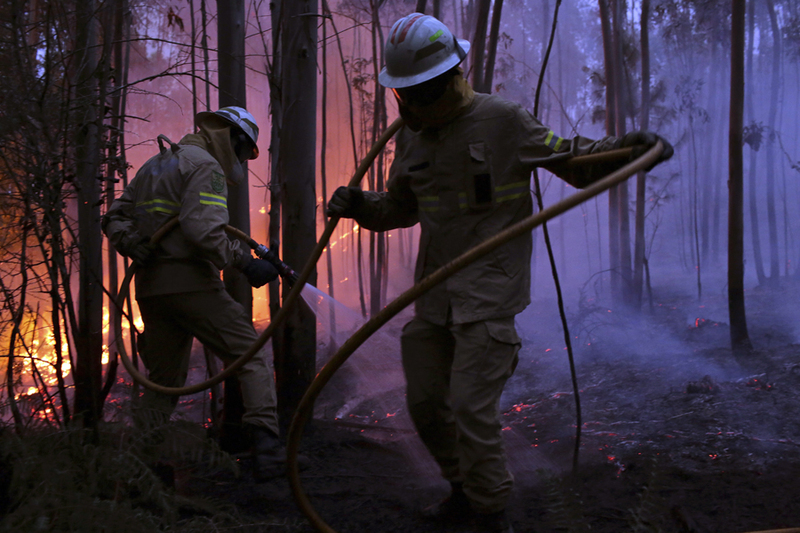 Almost 24 hours after the deaths Saturday night, fires were still churning across the forested hillsides of central Portugal. Police and firefighters were searching charred areas of the forest and isolated homes, looking for more bodies. “It is a time of pain but also … a time to carry on the fight” against the flames, President Marcelo Rebelo de Sousa told the nation in a televised address Sunday evening after the government declared three days of national mourning. A huge wall of thick smoke and bright red flames towered over the tops of trees in the forested Pedrogao Grande area, 95 miles northeast of Lisbon where a lightning strike was believed to have sparked the blaze Saturday. Investigators found a tree that was hit during a “dry thunderstorm,” the head of the national judicial police said. Dry thunderstorms are frequent when falling water evaporates before reaching the ground because of high temperatures. 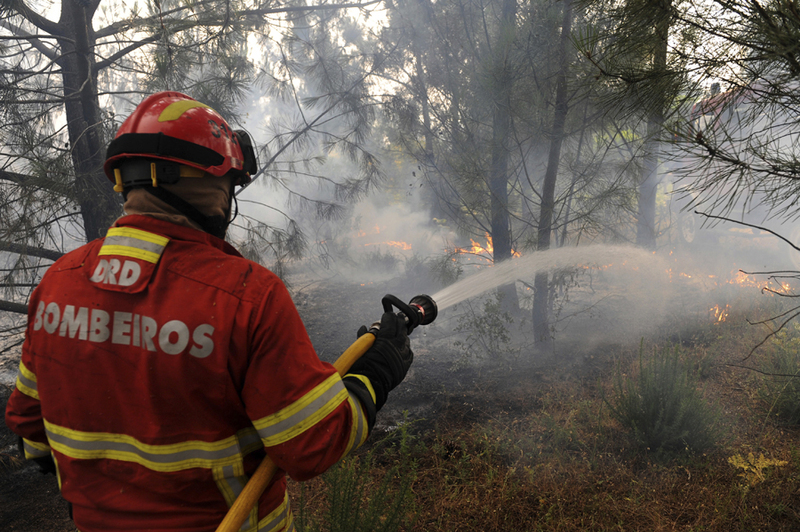 Portugal is prone to forest fires in the dry summer months and temperatures as high as 104 Fahrenheit hit the area in recent days. Interior Minister Constanca Urbano de Sousa said the death toll had risen to 62 by the end of Sunday. She said the country’s judicial police was expecting to complete the identification of the bodies soon in order to release them as early as possible. Interior Ministry official Jorge Gomes said firefighting crews were having difficulties battling the fire, which was “very intense” in at least two of its four fronts. He said authorities were worried about strong winds that could help spread the blaze further.